Hummingbird-Guide Store Testimonials. Excellant Customer Service Satisfaction. Here are some Hummingbird-Guide Store Testimonials from our happy customers. We would appreciate your testimonial. Please fill out the form below to submit yours. I ordered a Dr. JB's Clean Feeder SE6002. I received the order promptly but did not put the feeder out until I saw some Hummer activity. 3 days after putting the feeder out I had an issue with the feeder. It happened on a Saturday (of course) when the distributor was closed. I e-mailed James and within a short time James e-mailed me back and said he was sorry for the inconvenience and would make contact with the distributor first thing Monday morning. He did and I received my replacement feeder with in days.Now, that is customer service! My plans are to order from Jim and Ruth when ever I need something for those little guys. "I Thank You Jim & Ruth! Pleasant $urpri$e and it's still the thought that counts ~ combining orders made within a short period of time...*brainfart on my part and getting a little sidetracked. Says much for you and your service! Ordered yesterday morning, goodies arrived today...?...don't know how you did it, another nod & a *wink for zip'service." "Excellent service and I love my new hummingbird feeders and especially the mixing container!" "Excellent product and service. I highly recommend your business." "Everything arrived quickly. I noticed the quality of the ant moats as compared to those found in stores. Also, anxious to use the hummingbird nesting helper for the first time. Will order again in the future." "Great great customer service. I was missing one item, I notified the company, received an email right back saying it was being taken care of and it was completely corrected with the missing item in my hands within 3 days. Wonderful. I'm so glad I found you on the Internet." "I have never dealt with such a caring company as Hummingbird-guide store. I had a problem with a hummingbird feeder that I bought and James handled the problem like a pro. There are not many stores that go out of their way to please customers anymore and I really appreciate one that does. Thanks again James for a job well done. I am anxiously awaiting my new feeder." "Shopping on this web site was a most pleasant experience. The catalog is well laid out, and all products are nicely displayed and are presented with useful, descriptive information. The items I ordered arrived promptly and in excellent condition. Customer service was outstanding. I will definitely shop from this web site again as well as recommend it to others." "Fantastic service! My order arrived in 3 days as promised and the shipping was free." "I collect Woodstock Wind chimes and have 6 already. I love them. I am a musician and you can’t beat the musical integrity of these chimes. This website has an excellent selection. I listened to all of the sounds bytes and was able to find many more for future purchases. The shipping was extremely fast. I plan to shop here from now on." "Awesome website! I love hummingbirds! This website has everything. I bought 3 feeders, ant moats, hummer helmets, brushes, natural nectar without red dye, nesting material and a webcam. I am so excited." "One of the largest, most informative and fun websites about hummingbirds and hummingbird products I found on the internet!" "This company is a true Ma and Pa. Jim and Ruth were available and answered all of my questions. This type of personal service is almost impossible to find on the internet." "I ordered the Cowboy Wind Chime, it is beautiful. I really like that you can listen to the wind chimes before you buy. This chime sounds just like the "Happy Trails" sound byte." "Thank you for the information and for you fantastic website. You have been a great help and I look to your website often." "Your website helps alot because we needed all that information to maitain our little friend(hummingbird).Thank you." 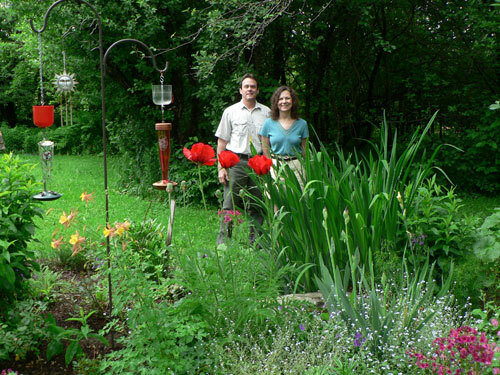 "I recently ordered two of the Jewel Box Window feeders for hummingbirds. I have had many feeders but this product is my absolute favorite. It allows maximum viewing and is super easy to clean. All my other nectar feeders are gone!! LOVE IT." "Just a few words of appreciation. We are new to keeping hummingbirds and the needs they have. Both of us enjoy watching the birds in our back yard, but having a humming bird flash by you and hearing their wings is just amazing. James and Ruth have been so helpful with all the info they provide and the quality of the merchandise is excellent. Their quick response to all our questions are amazing, you don't wait for days, it's almost instantaneous." Thank you both for what we call "good old fashion" service. "The feeder is a present for my wife on Mother’s day, but I am certain she will love it. As for the process, it worked exactly as expected. The package was delivered earlier than required and was well packaged and the product is great. Keep up the good work." "I love the quality of the feeder I purchased, along with how easy it is to clean. I'm not sure my group of hummers like it. Since I switched out my leaky feeder the hummers don't frequent it like they used to. My mixture is the same (mine was the same recipe you sent) so I'm not sure whats up. They may just have to get used to it or maybe they miss the yellow flowers around the feeding openings. But very happy with the product." "The Bamboo Wind Chime was just what I was looking for. Shipped promptly. Thank you for such great service."